Apex is a 'flagship' range of versatile compact speakers from Monitor Audio. Blending elite styling with the advanced technologies of our award-winning 'Platinum' 'GX' and 'RX' hi-fidelity speakers, the Apex range achieves a level of design integrity, performance and versatility that raises the bar for the compact sat/sub speaker system market. The three model line-up is made from rigid die-cast aluminium coated in a sumptuous black metallic or pearl white metallic high gloss lacquer. Two satellite speakers, the A10 and the larger A40, and a powerful 500W (RMS) active subwoofer, the AW-12, share a beautifully curvaceous design, which oozes a sense of luxury and style to complement the finest contemporary interiors. A C-CAM® bass driver has been engineered exclusively for the Apex design. It uses the high performance RST® dimpled cone geometry, successfully employed by our RX hi-fi speakers. The 140mm RST cone is suspended on a rigid die-cast aluminium chassis and driven by an over-sized motor system featuring a high power voice coil with vented cooling. Paired with the bass driver is an optimised 25mm C-CAM gold-dome tweeter, FEA-tuned to reach beyond 35kHz. The drivers are secured to the cabinet using a single central through-bolt fixing, which has the advantage of mechanically de-coupling the driver and baffle to enhance mid-band clarity and resolution. Each bolt acts as a cabinet brace to further reduce resonance. Innovative high quality metal wall brackets supplied with the A10 and A40 are custom designed to make installation quick, easy and secure. 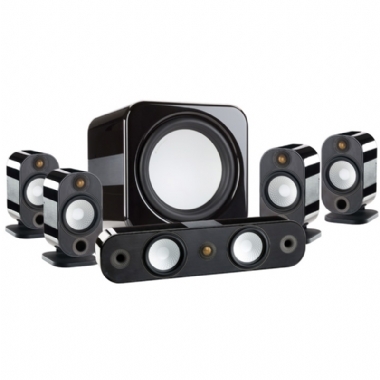 When installed, the speaker can be tilted precisely for the best stereo or surround sound imaging. A stylish floor stand for the A10 is available, which is pre-wired internally for a superior 'wire-free' look. Due to its precision-engineered voicing, the Apex range can be mixed in any combination of satellites and subwoofer to match room size, shape and acoustics, delivering the audio range and quality of much larger hi fi speakers in an extremely stylish and space-friendly way.